The soma (pl. somata or somas), perikaryon (pl. perikarya), neurocyton, or cell body is the bulbous, non-process portion of a neuron or other brain cell type, containing the cell nucleus. The word 'soma' comes from the Greek 'σῶμα', meaning 'body'. Although it is often used to refer to neurons, it can also refer to other cell types as well, including astrocytes, oligodendrocytes, and microglia. There are many different specialized types of neurons, and their sizes vary from as small as about 5 micrometres to over 10 millimetre for some of the smallest and largest neurons of invertebrates, respectively. 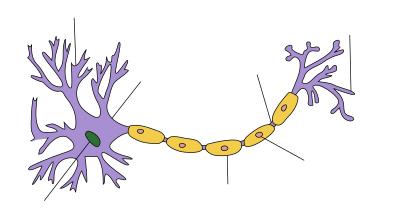 The soma of a neuron (i.e., the main part of the neuron in which the dendrites branch off of) contains many organelles, including granules called Nissl granules, which are composed largely of rough endoplasmic reticulum and free polyribosomes. 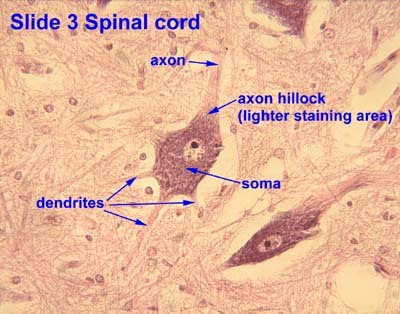 The cell nucleus is a key feature of the soma. The nucleus is the source of most of the RNA that is produced in neurons. In general, most proteins are produced from mRNAs that do not travel far from the cell nucleus. This creates a challenge for supplying new proteins to axon endings that can be a meter or more away from the soma. Axons contain microtubule-associated motor proteins that transport protein-containing vesicles between the soma and the synapses at the axon terminals. Such transport of molecules towards and away from the soma maintains critical cell functions. ^ Bazargani, N; Attwell, D (February 2016). "Astrocyte calcium signaling: the third wave". Nature Neuroscience. 19 (2): 182–9. doi:10.1038/nn.4201. PMID 26814587. ^ Baumann, N; Pham-Dinh, D (April 2001). "Biology of oligodendrocyte and myelin in the mammalian central nervous system". Physiological Reviews. 81 (2): 871–927. doi:10.1152/physrev.2001.81.2.871. PMID 11274346. ^ Kozlowski, C; Weimer, RM (2012). "An automated method to quantify microglia morphology and application to monitor activation state longitudinally in vivo". PLoS ONE. 7 (2): e31814. doi:10.1371/journal.pone.0031814. PMC 3294422. PMID 22457705. ^ a b Squire, Larry; Berg, Darwin; Bloom, Floyd; du Lac, Sascha; Ghosh, Anirvan; Spitzer, Nicholas, eds. (2008). Fundamental Neuroscience (3rd ed.). Academic Press. ISBN 978-0-12-374019-9. ^ Delcroix JD, Valletta J, Wu C, et al. (2004). Trafficking the NGF signal: implications for normal and degenerating neurons. Prog. Brain Res. Progress in Brain Research. 146. pp. 3–23. doi:10.1016/s0079-6123(03)46001-9. ISBN 9780444514721. PMID 14699953. This page was last edited on 21 February 2019, at 09:51 (UTC).